Caterpillar recently celebrated the manufacture of the 1000th Cat® 797 mining truck. With 400 short t (363 t) payload capacity, the 797F model is Caterpillar’s largest truck and the largest mechanical drive mining truck in the world. The 797 is the only mining truck in the size class to reach the 1000 milestone. The first 797 placed in a mining operation was commissioned in 1999 and is still in service – with more than 130 000 hr working in Canadian oilsands. Extended durability has helped the 797 become a mainstay in Canadian oilsands operations. Since that time, the breadth of applications has grown to include copper, coal and iron ore mines – with the largest populations working in North America, South America and Australia. 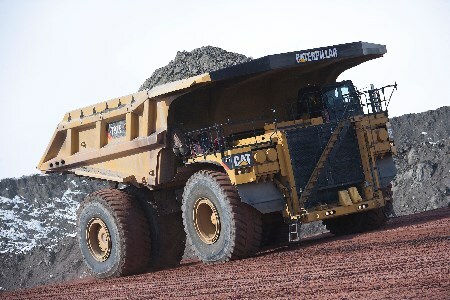 “The 797 has proven its ability to deliver high production in the most challenging conditions – from the extreme cold and soft underfoot conditions of the Canadian oilsands to high altitude, deep pit copper applications in South America,” said Sudhanshu Singh, Global Product Manager, Large Mining Trucks. The 20 cylinder, quad-turbocharged Cat C175 engine powers the 797F. Producing 4000 hp (2983 kW), the C175 delivers more power for faster acceleration, faster speed on grade and greater productivity. For applications that do not require the highest power, such as the flat hauls found in many coal and iron ore applications, a 3550 hp (2647 kW) setting is available. A variety of fuel maps are available to balance productivity and fuel consumption, and a Tier 4 configuration is available to meet North American exhaust emissions standards. As with all Cat large mining trucks, the 797F features a complete power train designed and manufactured end-to-end by Caterpillar. Caterpillar assembled the 1000th 797 and all of its predecessors at its Decatur (Illinois, USA) facility. The Decatur facility assembles all Cat large mining trucks.